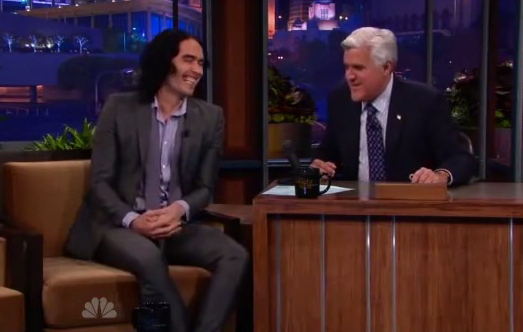 Russell Brand was interviewed by Jay Leno on The Tonight Show, Monday night, March 28, 2011, (Season 19 Episode 55). They discussed his new movies, Arthur and Hop, getting his driving license, marriage and meditation. A very interesting and funny interview! Unfortunately that segment of the show, posted by two You Tubers, was removed. Since Russell took his mother as his date to The Oscars, I was curious to know who she was. I found and read this wonderful article from The Sunday Times archive about their relationship: Relative Values: Russell Brand and his mother, Barbara. A loving and amazing story! Ever since Russell started TM and married Katy, he’s calmer, cleaner, classier, and still as funny as ever, even wittier! And his career has really taken off, which is nice to see. He should be great in Hop since he’s so expressive, always speaking in such an animated manner. This entry was posted on March 31, 2011 at 9:12 pm and is filed under Videos. You can follow any responses to this entry through the RSS 2.0 feed. You can leave a response, or trackback from your own site.